The predictions come at the same time as a NASA report that found 2018 was the fourth hottest year on record, wrapping up the warmest half-decade stretch recorded yet. Climate experts around the world released information on global temperatures in 2018 on Wednesday. 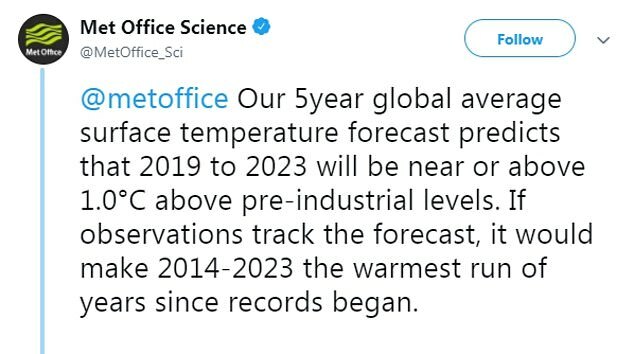 Professor Adam Scaife, head of long-range prediction at the Met Office, said: '2015 was the first year that global annual average surface temperatures reached 1C above pre-industrial levels, and the following three years have all remained close to this level. Dr Doug Smith, Met Office research fellow, said: 'A run of temperatures of 1C or above would increase the risk of a temporary excursion above the threshold of 1.5C above pre-industrial levels. 'The 20 warmest years on record have been in the past 22 years. The degree of warming during the past four years has been exceptional, both on land and in the ocean. 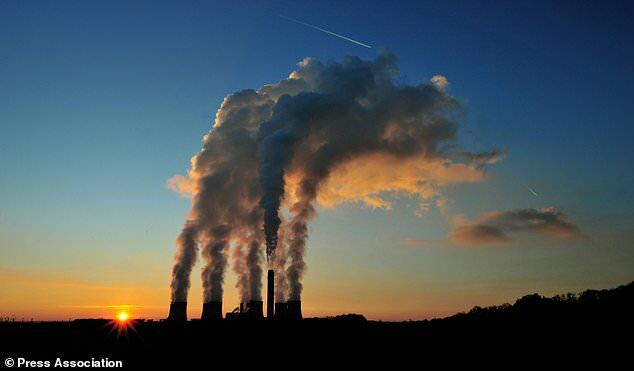 Prof Sir Brian Hoskins, chair of the Grantham Institute, Imperial College London, said: 'Our lack of decisive action over climate change makes us like a climber ascending a mountain, knowing that there will not be enough oxygen at some height, yet still we go on. Please include the F temp scale in articles for us prehistoric old farts in America. Last years frosts was hell on my gardening. A proviso must be added as several of our recording stations have frozen over the their data is suspect.